The Crazy Bookworm: Attention Ontario Bloggers: YA Apocalypse Book Tour! Attention Ontario Bloggers: YA Apocalypse Book Tour! 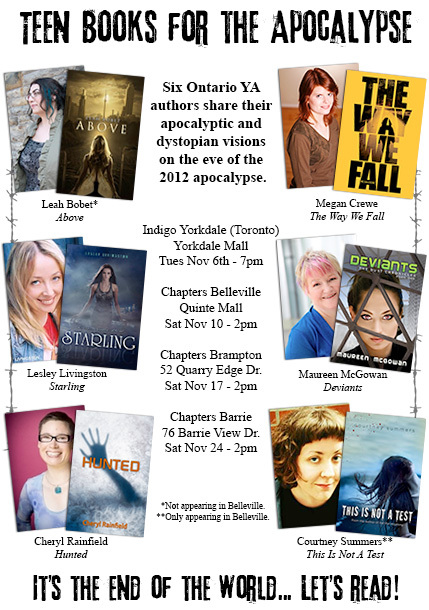 This November, preparation for the 2012 apocalypse, six Ontario authors of apocalyptic and dystopian YA fiction will be touring around the province, chatting with readers, signing books, and offering great prizes to those who attend! Tuesday Nov 6, 7pm – Indigo Yorkdale, Yorkdale Mall (Toronto) – Leah Bobet, Megan Crewe, Lesley Livingston, Maureen McGowan, Cheryl Rainfield. RSVP on Facebook! I am so there! I am going to try to at least 3 of these events! How about you?